Anyone who has visited my home or office knows that Himalayan salt lamps are in every room. I’ve been in love with them and the environment they create for over twenty years. 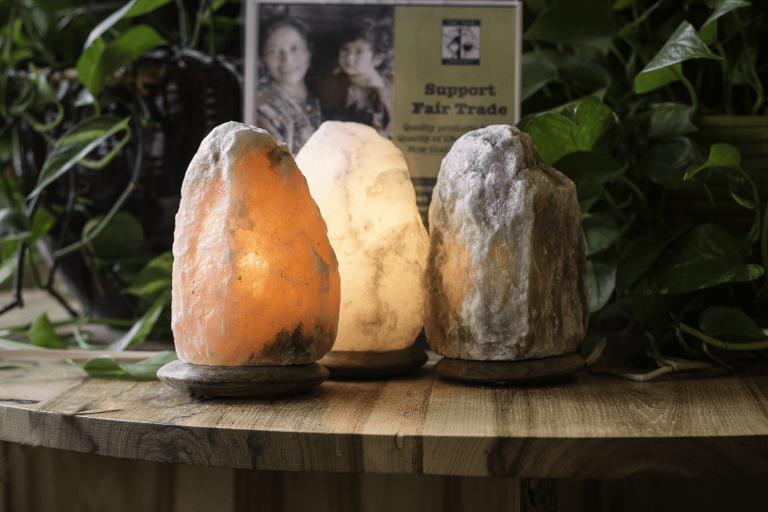 I sold salt lamps in my office for many years, and now I‘m thrilled to offer them from my website here. So Well manufactures the salt lamps offered on Mindful Pathways. Their lamps are elegant and dependable. I love the uniqueness of the white lamps, particularly the cube shape. In addition to white lamps, they offer traditional amber lamps and also the grey salt lamps in assorted sizes and shapes. The more salt lamps you have in your home the softer the atmosphere and the less EMF disturbance from microwaves, other kitchen appliances, TVs, and computers. The lighted lamps produce negative ions that help keep the air fresh, easing symptoms for allergy sufferers. You can even add salt to your shower and turn it into a relaxing, healthy salt therapy spa. A salt lamp sits on my nightstand as a night light and as a sleep aid. The soft glow is soothing and adds a peaceful ambiance to my bedroom. The biggest complaint I hear about bedroom lamps is, “I can’t sleep with a light on in the room.” Each So Well lamp has a dimmer switch so you can adjust the glow to meet your taste and needs. Or, you can choose a deep amber lamp or a gray lamp that creates less light. Creating a relaxing environment at home and at work is both fun and beneficial. A lamp makes a noticeable difference as soon as you light it. Leave your lamp on 24 hours a day to create a constant healing, peaceful atmosphere. ***Mindfulpathways is an affiliate of So Well. When you click a salt lamp photo, it will take you to the So Well website where you can browse. If you choose to purchase a lamp, it will be shipped from So Well. You will be happy to know that So Well is a fair trade company.